The Chinese community is one of the most social out there, and any excuse is used to get together. Because I’m always working I don’t get the chance to cook for others as much as I used to, but maybe three times a year I’ll spend two or three days putting a menu together, a day shopping and then I’ll cook up a big banquet for my friends. Food means so much to me that I just want people to enjoy it. It’s like a cleaver to my heart if they don’t. This sole recipe is one I would serve up as part of a love-banquet for my nearest and dearest. PREPARATION TIME 5 MINUTES. COOKING TIME 14 MINUTES. 1. Place the sole on to a heatproof serving plate that fits into a deep, hob-proof roasting tray. Place two upturned ramekins into the roasting tray, then place the plate with the sole on top of them. Season both sides of the sole with salt and white pepper. Drizzle the soy and fish sauce over the sole and scatter over half of the ginger. 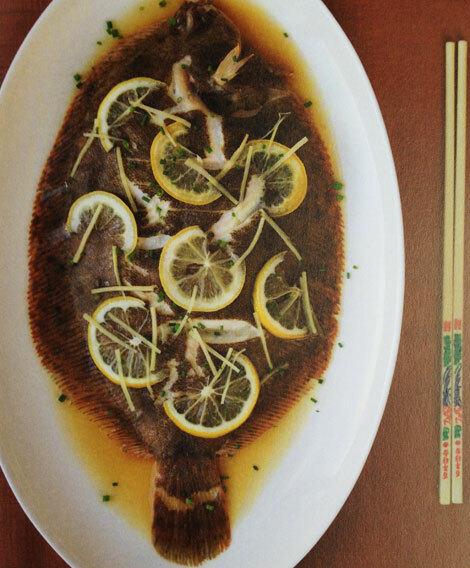 Lay the slices of lemon over the fish, cutting them in half if necessary, then cover with the remaining ginger. 2. Carefully pour hot water into the roasting tray, making sure you don’t get any on the plate containing the sole. Cover the roasting tray with foil, ensuring the foil doesn’t touch the sole (make a tent if necessary) and place the tray directly on to the hob. Heat over a medium heat, ensuring that the water is simmering and steaming. Steam for 10–14 minutes or until the flesh is opaque. 3. Remove the plate from the roasting tray. Garnish the fish with chopped chives and serve with rice on the side (see below). 1. Wash the rice, rubbing the grains together between your hands to release any excess starch. Change the water and repeat until the water is clear after rubbing. 2. Once you are ready to cook the rice, place it into a saucepan with a tight-fitting lid. Cover the rice with water so that the water comes 2cm above the level of the rice. Place the pan, without the lid, on to the hob and bring to the boil. Boil until the water has reduced and is forming bubbles at the top of the rice. 3. Cover and reduce the heat to the lowest setting and leave to cook for 10 minutes. Once all the water has been absorbed and the rice is tender, remove the lid, fluff the rice and leave to steam-dry a little before serving.